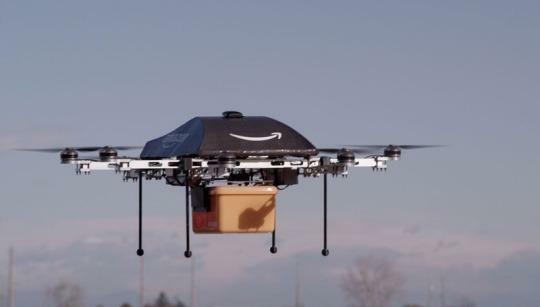 Amazon raised a lot of eyebrows last year when it announced that it was planning to start delivering packages by automated drones. How would that work? Would the skies become black with automated flying delivery vehicles? Would they collide with planes? How would they deal with apartment buildings? Last month, Amazon released a new video showing a prototype of one of its delivery drones, which shares features of both helicopters and airplanes. Clearly, the company is proceeding full speed ahead with this radical idea. Recently, while researching a story about the legal status of drones for CBS Sunday Morning, I interviewed Paul Misener, Amazon’s vice president for global public policy. Given the speed with which Amazon is apparently advancing with its drone program, I thought it’d be a good time to publish a more complete version of that interview here. 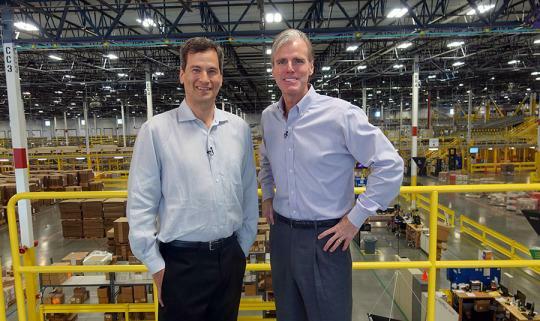 David Pogue: First of all, tell the unenlightened about Amazon Prime Air. Paul Misener: Well, soon after I joined Amazon in early 2000, my young son was sitting on my lap. We ordered something from Amazon, and he hopped off and ran up to the front door, waiting for the brown truck to show up on the spot. That was a high-delivery expectation. (Laughs.) I had to explain that just because we’d bought this thing doesn’t mean it’s at the front door yet. So Prime Air is a future delivery service that will get packages to customers within 30 minutes of them ordering it online at Amazon.com. The goals we’ve set for ourselves are: The range has to be over 10 miles. These things will weigh about 55 pounds each, but they’ll be able to deliver parcels that weigh up to five pounds. It turns out that the vast majority of the things we sell at Amazon weigh less than five pounds. And will it cost more or less than a regular package? I don’t know that we’ve priced it out yet. OK, a few questions pop up right away. What if I’m not home? It gets delivered to your doorstep, or wherever you want in your yard, just as it would be if it were delivered by the UPS truck. What if there’s some guy with a shotgun who sees that I’m getting a TV and wants to shoot it down? I suppose they could shoot at trucks, too. We want to make the deliveries. And we believe that these Prime Air drones will be as normal as seeing a delivery truck driving down the street someday. So the novelty will wear off. Do you have the drones you’ll be using? We have different prototypes we’re working on simultaneously — different kinds of drones for different kinds of delivery circumstances. Our customers in the United States live in hot, dry, dusty areas like Phoenix, but they also live in hot, wet, rainy environments like Orlando, or up in the Colorado Rockies. Likewise, obviously, our customers live in a wide variety of buildings. Some live in rural farmhouses, some live in high-rise city skyscrapers, and then everything in between, in suburban and exurban environments. We want to be able to serve all of those customers. And it may take a different kind of a drone to best work in each one. You’re designing and building your own drones? So these aren’t off the shelf? No, actually these are quite different than the drones that you can buy in a store and fly around. These are highly automated drones. They have what is called sense-and-avoid technology. That means, basically, seeing and then avoiding obstacles. These drones are more like horses than cars — and let me explain why. If you have a small tree in your front yard, and you want to bang your car into it for some reason, you can do that. Your spouse might not be happy with you, but you can do it. But try riding a horse into the tree. It won’t do it. The horse will see the tree and go around it. Same way our drones will not run into trees, because they will know not to run into it. How do you solve the apartment-building problem? We’re working on it. And again, it might be changing the design of the drones, so that they better serve that kind of an urban environment. Or maybe the apartment-building owners could designate, you know, a spot on the roof, or in the courtyard? That’s entirely possible. We’re thinking through those. Would it help Amazon not to have to pay shipping companies? To have it under your own control? Well, that’s not the purpose of it. It’s really to fulfill a need that we believe our customers have. Usually they need that delivery in a few days, and that’s sufficient. But, for example, let’s say your grandchildren are visiting you at the end of the month. You want to stock up on batteries. So you go to your computer, your laptop, your tablet, or your smartphone, go to the Internet, go to Amazon.com, and stock up on batteries. They’ll be delivered a few days later, and that’s fine. But what if one of your grandchildren is already visiting you, and she’s playing with an electric truck on the floor, and the battery wears out? On one hand, you could get her all bundled up, put her in the car, and drive to the store to get the battery replacement, and drive all the way back. Wouldn’t it be so much better if you could just go online from Amazon and order it, have it delivered in 30 minutes? Well, it’s actually not as difficult as you might think. The automation technologies already exist. We’re making sure that it works, and we have to get to a point where we can demonstrate that this operates safely. So which problem is harder to solve? The technological ones or the red tape? Well, the regulatory issues to which you refer are difficult. And once we demonstrate the safety of the system, we believe that the regulations will quickly follow. Amazon ships millions and millions of packages a week. Won’t it be loud to have the sky filled with buzzing Amazon drones? Well, it’s not gonna be some science fiction, Hitchcock scenario; that’s a bit of an exaggeration. But if we design these correctly, they won’t be loud and obnoxious and noisy. It’s a really cool engineering challenge, it turns out. I mean, there are a bunch of challenges. But dampening the noise is one of them. And how will you keep these drones from interfering with air travel? Well, we’ve proposed to regulators around the world, including the FAA, a certain kind of an airspace design that would keep the drones separated from the aircraft. We were thinking: Manned aircraft above 500 feet. Between 400 and 500 feet there’d be a no-fly zone — a safety buffer. Between 200 and 400 feet would be a transit zone, where drones could fly fairly quickly, horizontally. And then below 200 feet, that would be limited to certain operations. For us, it would be takeoff and landing. For others, it might be aerial photography. The realtors, for example, wouldn’t need to fly above 200 feet to get a great shot of a house. How have the FAA and NASA reacted to this proposal? I think they welcome the thinking that has gone into it. So I’m hopeful that this will spur discussions about exactly how to get this right. How does this proposal, the layers idea, differ from what NASA’s working on? It’s with a similar goal in mind. We presented this proposal at a NASA conference, and we’re of the same mind. We need to figure out this airspace. My impression is that the FAA and Amazon haven’t exactly seen eye to eye on your plan. In deference to the FAA, or in sympathy with the FAA, it turns out that they have a limited ability to regulate amateur drones, but they have full powers to regulate commercial drones. To my way of thinking, at least, that imbalance doesn’t make sense. At the very least, they ought to be treated the same, to give the FAA the same authority to regulate both amateur and commercial drones. Arguably, you would want to regulate the amateurs even more, because they have less training, their drones are less sophisticated, and so forth. So certainly that part of law needs to be clarified, at a minimum. 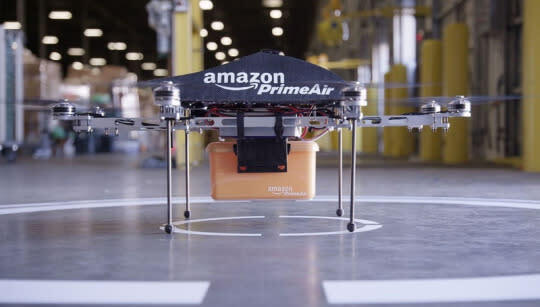 We believe that they must begin, in earnest, planning for the rules that are more sophisticated, that go to the kinds of operations that Amazon Prime Air will encompass. And other countries already are doing this. Well, what happens if the technology is ready, everything’s ready, but the FAA still doesn’t have regulations in place for Amazon? Well, we have customers all around the world, of course. There’s no reason why the United States must be first. We hope it is. When you tell people what you do at parties, what do they say? Well, I’m an engineer and a lawyer. They don’t talk to me at parties. (Laughs.) But when they do deign to talk to me and ask me about Prime Air, they always ask me the questions you led with: Is it real? Or is this science fiction? Is this just all some big marketing thing? I can tell you, it is very real. We’ve beefed up a team at Amazon Prime Air that includes aeronautical engineers, roboticists, a former NASA astronaut. These folks are completely focused on making this a reality — and demonstrating that it is safe before we begin operations. Challenges are there, for sure, but once we demonstrate that this is safe, we’ll be able to take it to the regulators and hopefully deploy it for our customers quickly. I’ve seen it. It’s gonna happen. It’s coming.